At last! Summer is here! Time to get up off that couch and see something of the world. And what better part of the world to explore than our own beloved USA? There’s no shortage of exciting and interesting places to visit and lucky us, many of the most beautiful, most historic, most fragile have been set aside and protected, for us and for future generations – the National Parks. 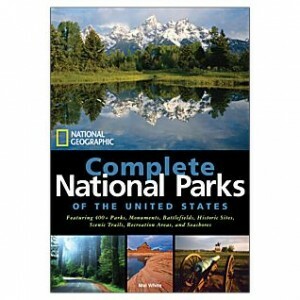 National Geographic’s Complete National Parks of the United States is a great place to start if you’re not sure where you want to go. In fact, it might make you to realize you’d like to go everywhere, the pictures are so enticing and beautiful. The descriptions of each park are short and to the point – you will want to do more research if you are planning a major stay – but this gives you the highlights and must-sees. It’s also useful to show you places you might want to stop along the way – maybe schedule a stop at the lesser known Black Canyon of the Gunnison on your way to the Grand Canyon, or reroute to visit to the Tuskegee Airmen National Historic Site when heading to the Everglades. Website and contact information is included for each site. They conjure images of magnificent scenery, destinations for summer vacations with family and sites of historical significance. Most American’s feel a fierce pride in these beautiful places and they should – the National Parks preserve some of the most beautiful and most important locations in our country. They are also uniquely American – before Yellowstone was set aside as the first National Park in 1872, land was preserved only for royalty or the very wealthy. Never before had land been set aside for the people and, like so many of the ideals that America has reached for, it has now become a standard for the rest of the world. 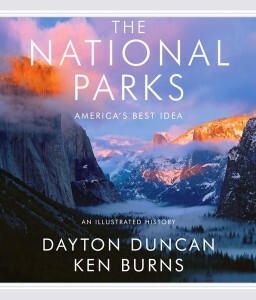 Ken Burn’s spent 8 years filming and creating the six-part PBS series The National Parks: America’s Best Idea which explores the history of the National Parks, from exploitation to spiritualism to conservation, a mirror of the character development of the American people. Co-written with Dayton Duncan, the companion book is as magnificent as the lands and peoples it portrays, heavily illustrated and with vivid writing that bring to life the characters and events that shaped the parks. Be sure to visit the PBS website for the series which has some cool features including background information on the filming of the series, a place for you to share your own National Park stories and in-depth information about visiting the parks. And in case you missed the series when it ran in September, you can now watch the episodes online. Or put a hold on the library’s copy. And celebrate your American heritage. 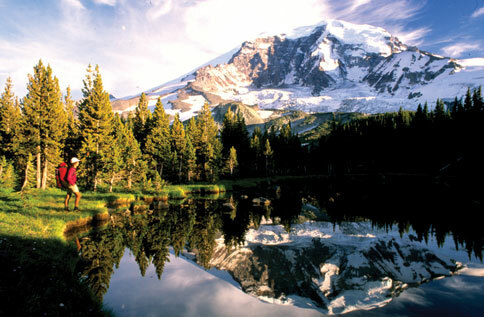 Do you like to visit the National Parks? 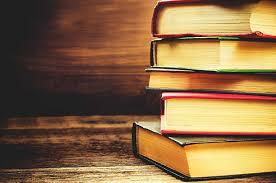 Do you like murder mysteries with a little romance thrown in? Check out the Nevada Barr mysteries. Her heroine is Anna Pigeon, a National Park Service Ranger who runs away from Manhattan after the death of her first husband. Each book deals with a murder in a National Park as Anna moves from post to post. Her descriptions of each park are great, making you want to visit. Flashback takes place in the Dry Tortugas National Park which is seventy miles off Key West. The story includes a current murder as well as the history and lore of the island, which is the site of historic Fort Jefferson. Anna’s sister Molly finds letters written by their great-great aunt who lived at the fort during the Civil War. With the letters providing the history of the fort and Anna’s description of her current posting at the park, you feel you are really there. After I read the book I had the opportunity to visit Key West and take a catamaran trip to Fort Jefferson; Nevada Barr’s vivid descriptions were right on the mark..